I am lucky that some of my closest friends had children around the same time as I had my youngest son. It is lovely to always have someone to meet at the park or to play with at toddler group and soft play. These days are sadly now behind us (sob) as our children are now aged 4 or 5 and attend school or nursery. It is so hard to get everyone together so we do try and make an effort during the holidays. I noticed a deal on Michelino's Facebook page that looked too good to refuse. During Happy Hour there is 20% off food and kids eat free. I promptly booked a table for the 10 of us. Happy Hour is available between 12noon-2pm and 5pm-6:30pm Monday-Friday. One child up to the age of 12 eats free per adult. Children can choose any pizza or pasta and they are the same size as an adult portion so this worked out to be extremely good value. Management of this offer does seem a little haphazard - when I first phoned to book I was told they didn't open over lunch (and had to wait for a manager to call me back) and when we were given our bill the children's meals hadn't been taken off (this was easily rectified). There was about a 45 minute wait for food as well which wasn't ideal (especially as we were the only ones there). Our children were thankfully happy enough though and we were given some freshly baked bread to tide us over. 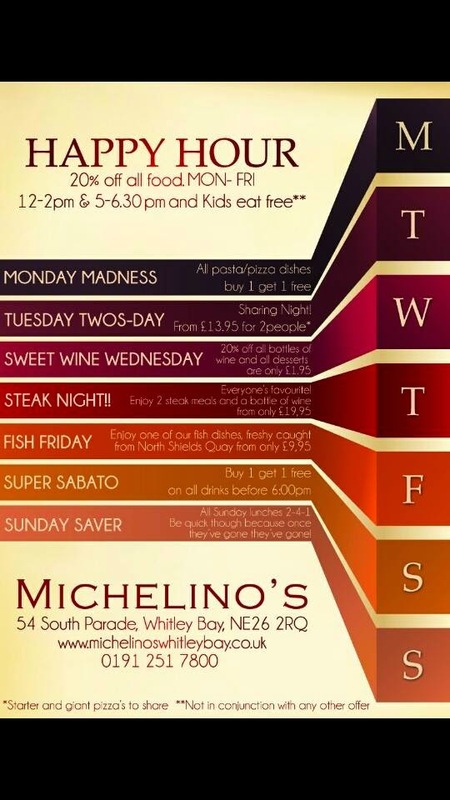 Hopefully these are all just teething problems as Michelino's gets to grips with their new deals. Our pizzas were handmade, authentic and delicious and at less than £8 per mum and child including drinks it was a real bargain! I will definitely be booking again. After lunch it was time to cross over the road and take a walk along the beach. It was a mild day and our boys could spend forever identifying rocks, throwing stones into the sea and running from the waves. It was lovely to hear them all laughing together. We had the best time at the beach and I think it shows in their little faces! At only £4 per person for pizza and a drink followed by unlimited fun at the beach it certainly was a very budget friendly but very enjoyable way to catch up with friends. Michellino's is great - its two streets away from my house so we go there quite a bit. Nothing beats the freash air of the beach too! It is annoying isn't it but despite their errors it was so much of a bargain and the food was lovely that we will definitely be back soon. Yes, hopefully just a few teething problems! You really can't beat the beach whatever the weather! Everyone had a really lovely time - even the mammies! All the kids look like they're having a blast playing on the beach together. I bet the beach was the perfect way to burn off the energy they'd earned eating all their pizzas! I bet this trip will happen at many different stages throughout the year. Thanks for linking up with Country Kids. The kids sure did have a wonderful day - definitely one of our favourite days over half term. It is just lovely getting some fresh air and not spending money!